By Kathy L. Gilbert*6:00 P.M. ET May. 8, 2012 | TAMPA, Fla. The first week of The United Methodist General Conference-traditionally the 'slow' week-started with a bang and never stopped going. Marcie McFee, music director for the worldwide assembly, began the opening worship with loud claps of thunder and beautiful waves of sea green and blue images rolling across large video screens behind the worship area. The setting kept the seaside location of the Tampa Convention Center in mind while recalling the many occasions Jesus' ministry occurred by the Sea of Galilee. Woven into images of the sea were reminders of the many contributions to the church from indigenous people. Marcus Briggs-Cloud, a member of the Maskoke Nation and a son of the Wind Clan People, consecrated the opening worship and workspace in his native language and tradition. The highlight of Week One was "The Act of Repentance toward Healing Relationships with Indigenous Peoples" on April 27. The Rev. George "Tink" Tinker, a Native American theologian, and representatives from the U.S. and other lands brought the message of the contributions, pain and hope of indigenous people. As the service concluded, participants were encouraged to pick up symbolic stones from the "river of life" scattered in the worship area and take them back to their own communities "as covenant to continue to listen and to walk the journey of healing with one another." April 25 began with inspiring Episcopal, Laity and Young People addresses to the nearly 1,000 global delegates. Giving the Episcopal Address, Bishop Peter Weaver, New England Area, said Eastertide the 50 days between the celebration of the rising of Christ and Pentecost - was a perfect time to gather by the tidewaters of Tampa Bay. "Eastertide is a powerful time but also a time when out of the ocean of God's love comes a surging tide of rising resurrection life," he said. Three speakers, including the first person from Africa, gave the Laity Address. Betty Spiwe Katiyo, from Harare, Zimbabwe; Dr. Steve Furr, Jackson, Ala.; and Amory Peck, Bellingham, Wash., all began their addresses with the words "By the grace of God, I am a disciple of Jesus Christ." Krin Ali, who was accompanied by a larger than life pre-taped video from Joy Algodon-Bohol, gave the Young People's Address. Algodon-Bohol was denied a visa from the Philippines and could not deliver her speech live with Ali. Together the two challenged their brothers and sisters in The United Methodist Church to be "Charged. Rooted. United." The Psalmodia Choir, part of the National Choir of Côte d' Ivoire, sings during evening worship on April 26. In the center is Yvonne Kouame. A UMNS photo by Kathleen Barry. Click on image to enlarge. For the first time in the history of The United Methodist Church, more than 39 percent of the delegates were church members who live and worship in central conferences. The Committee to Study the Worldwide Nature of The United Methodist Church gave a multimedia presentation April 25 and bishops and pastors from around the world spoke to the delegates. The study committee wrote a liturgical covenant which they hope will be placed in The Book of Discipline. People-sized mosquitoes handing out neon orange mosquito swatters reminded delegates of the church's commitment to fight malaria on April 25, World Malaria Day. The United Methodist Church has raised $20.2 million to support the denomination's Imagine No Malaria campaign and has made a significant impact on hundreds of thousands of lives. Delegates began working in 13 legislative committees to consider the 1,200 petitions April 26. The day also signaled the start of a roller-coaster ride otherwise known as a plan to restructure the denomination. Committee members considered a proposal from the Connectional Table, a legislative petition from the Methodist Federation for Social Action and an unofficial proposal known as Plan B submitted by an ad hoc group of delegates. 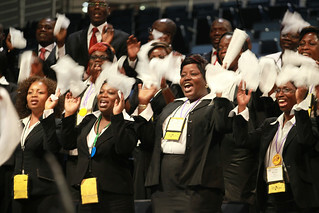 Ecumenical delegates from 24 affiliated Methodist or united churches around the world were welcomed to the assembly. A majority of the 24 churches were mission-founded by United States-based denominations that were predecessors of The United Methodist Church. United Methodist Women from around the world participate in a rally against private prisons during General Conference. The rally was sponsored by United Methodist Women and the United Methodist Task Force on Immigration. A UMNS photo by Paul Jeffrey. Click on image to enlarge. Holy conversations scheduled for delegates to talk about homosexuality, were cut short when the conference schedule got off track. Later, one delegate said he felt "bullied" during the conversations. Delegates leaving the April 26 evening worship filed through lines of people wearing colorful stoles marking their support for efforts to change current laws forbidding the ordination of homosexuals and the conducting of same-gender services of union. 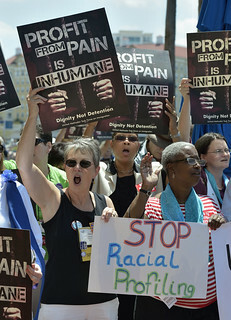 Bishop Minerva Carcaño of the Phoenix Area and Bishop Julius Trimble of the Iowa Area, co-chairs of the United Methodist Immigration Task Force, led a "justice rally" on April 28 to protest the growing private prison industry that especially targets immigrants and people of color. Delegates took a much-needed break on April 29, gathering at the end of the day for a celebration of the varied and far-reaching mission and ministry of the denomination. Four bishops led the plenary presentation on the four areas of focus adopted by the 2008 General Conference-ministry with the poor; global health; developing Christian leaders; and creating new places for young people. The evening concluded with the introduction of 23 missionaries and 17 deaconesses and home missioners who had been commissioned earlier in the day by the United Methodist Board of Global Ministries. *Gilbert is a multimedia reporter for the young adult content group at United Methodist Communications, Nashville, Tenn.